so, it's been on the last couple days--i think tomorrow starts round 6. i watch when i can, as it makes me a lil sad. anyways. 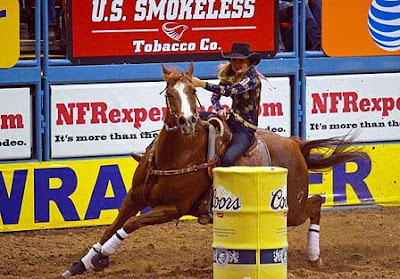 i said i would win the barrel racing by the time i was 40. i usually do just about everything i say will, so i imagine i probably will. (said i would make a book by the time i was 30. check.) wnfr, i'll see you sooner than later. til then, my favs are above. 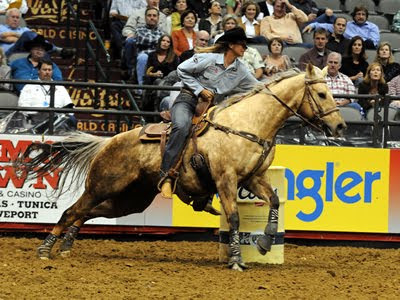 lindsay sears & sherry cervi (palomino). sherry lives in marana, az, which means she is my ultimate, ultimate fav. since i'm a tucson girl these days. i'm sorry to not know these horses. seems like everytime i see these cowgirls they're on a different horse. magic!